Quick and easy cyberpunk role-playing rules. OneDice Cyberpunk is a science fiction game set in the near future, where the world is run by multinational corporations and everyone either has an allegiance to a Corp or is considered an illegal. Information is power – and for those prepared to take the risks, a commodity well worth trading in. Internet users can directly plug themselves into cyberspace, and their avatars can battle for coveted information packets and other cyber-treasures. Most folk live in huge urban high-rise sprawls – the rich in their luxury apartments, the poor in run-down blocks, rented to them by their employers. On the edges of the cities, in the alleyways of the shanty towns, street gangs fight for scraps – battling each other and the corporation security goons, to survive. Whether working for a Corp, as an independent, a freedom fighter or in a gang, you’ll need all your wits, and a little luck, to survive. 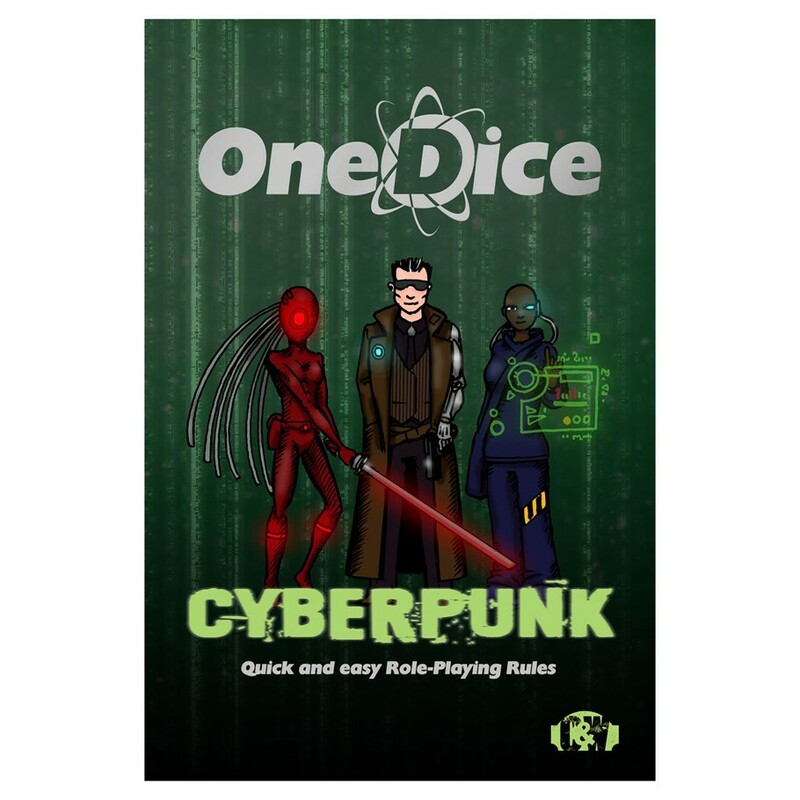 Whether you want to play cyberpunk games in a world of your own devising, or adventure in the ready-made near future described herein, all the rules you need are in this book. There are additional “skins” for adding Post Apocalypse and Machine World twists to the world. Grab a copy of OneDice Universal and you could also add magic or superheroes!